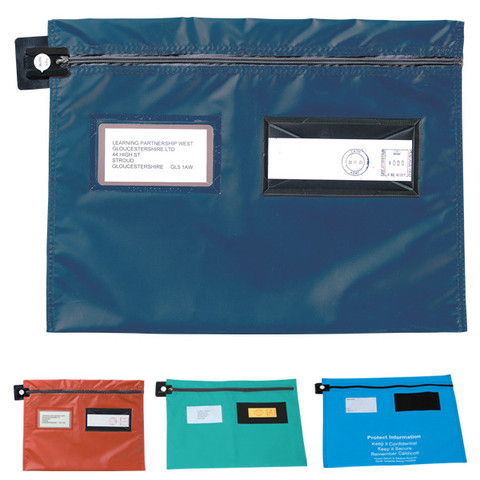 These high quality reusable and durable, flat security pouches, otherwise known as reusable, tamper evident security envelopes, feature a tamper evident locking mechanism, using either plain, colour coded or sequentially numbered security seals. Available in five sizes with a choice of colours from stock as below. With zip to top edge. Item # FP3 = 406mm x 305mm - £6.50 ea excl VAT and carriage. Item # FP4 = 457mm x 356mm - £7.50 ea excl VAT and carriage. With zip to side edge. Item # FP7= 336mm x 286mm - £6.00 ea excl VAT and carriage. Item # FP8 = 381mm X 355mm - £6.75 ea excl VAT and carriage. Item # FP9 = 470mm x 355mm - £7.50 ea excl VAT and carriage.